The animation company, Laika Entertainment (Coraline) produces a fun, stop-motion adventure. 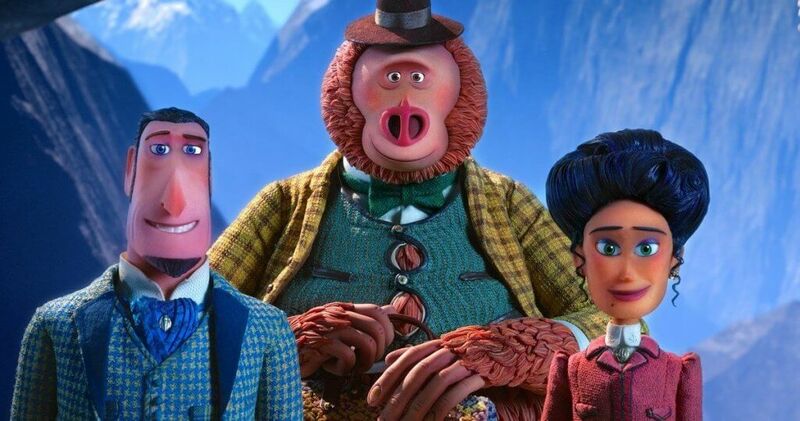 Set in Victorian times, Sir Lionel Frost (Hugh Jackman) is a British explorer who wants to find Big Foot and become a member of an exclusive club, whose members laugh at his desire to find the “mythical” creature. The head of the club, Lord Piggot-Dunceby (Stephen Fry) finds Frost to be a ridiculous man and finally agrees to a bet that if Frost discovers Yeti, he will let him join. However, he has no intention of keeping his part of the deal and once he’s informed that Frost has actually discovered Yeti, he hires a killer to stop him at any cost. Frost meets up with the creature in the Pacific Northwest. He’s 8 feet tall, covered in fur and has a big smile. He’s also good natured and gentle and Frost names him Mister Links (voiced Zach Galifianakis). Mister Links tells Frost that he’s lonely and wants to be taken to the Himalayans, so he can live with his “cousins”. Frost agrees and off they go on an adventure of a lifetime. They also take Adelina (Zoe Saldana), the widow of a fellow explorer, who just happens to have a map. They take a train, a ship, an elephant and finally hike through frozen terrain in order to find Mister Links a home. All through their trip, they encounter the ever-present hit man, who does his best to shoot Frost, throw him off a ship or push him off an ice bridge to his death. The characters are fun, the scenes are striking and there’s some good humor, mostly provided by Mister Links. Adults in the audience enjoyed the laughs and kids seemed to like the exciting adventure, however the fight scenes that were set up so the good guy could get killed off, is not appropriate for an animated family friendly film. MPAA Rating: Rated PG for action/peril and some mild rude humor.